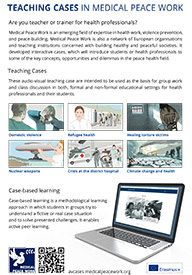 Learn how war and human rights violations affect health. Discover your unique role as a health worker. Speak out for the prevention of violence and promotion of peace. As medical professionals we care for the life, health and wellbeing of our patients. Violence, weapons and war cause enormous suffering and misery, and endanger what is important for us. It is therefore our professional responsibility to work towards the prevention of violence and the promotion of peace, human rights and human security. The role of physicians and other health workers in the preservation and promotion of peace is the most significant factor for the attainment of health for all. Log in here to the MPW online courses. 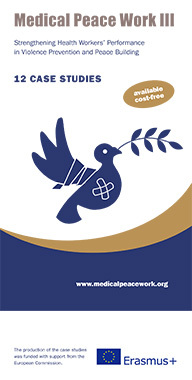 The Medical Peace Work III project is funded with support from the European Commission.